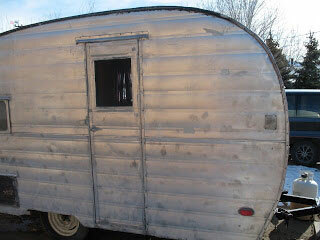 The manufacturer of Empire travel trailers was Empire Trailers Inc. They produced this model from 1950 to1960 at the factory at 1452 Chico Avenue in El Monte. While the last travel trailer left the factory floor in 1958, the company kept manufactured park models till 1960. Empire Trailers Inc. was an American manufacturer of travel and park model recreational trailers in the original City of El Monte, California, USA. In 1958 the city was split into the City of El Monte 91732 and the City of South El Monte 91733. The company logo displayed Empire State Building which represented a symbol of American strength in the 1950's. So it may be presumed that the iconic building influenced the name of the company. All the Empire travel trailers followed a similar paint convention which included a sky-blue lower-half band which dipped down and back up again near the wheel well opening. The upper half of the models was painted in white. The park models were, however, painted with different color schemes. The company produced this model during the period from 1950 to 1955. The 12-foot coach, with the overall length of 15 feet came with a single forged drop axle. This model was named Empire 15’ in Washington State as per the prevalent registration conventions. The walls were paneled with light birch, natural clear finish wood. The cabinets were fitted with maple or birch faced panels. The floor was fully carpeted although some later models may have had Linoleum flooring. The model looked smart with five opening aluminum framed windows and exterior aluminum drip rails. 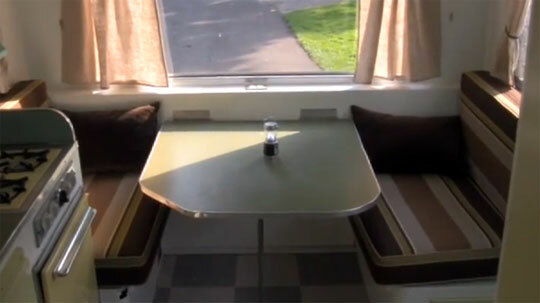 It was also fitted with 10 gallon fresh water galvanized steel tank located under the left dinette seat. The model called Traveler was manufactured between 1955 and 1958. It was a seventeen and half feet long coach having an overall length of 20 feet. The trailer had a single forged drop axle. It was built on all-steel ladder-type frame with tongue. Most Travelers were manufactured in basic version, many other fixtures and furnishing choices (for example custom carpet) were optional and came at additional cost. Loafer was a 24 feet long coach with an overall length of 27 feet. It was fitted with twin straight forged axles. It was rolled-out by the factory during relatively short period from 1955 to 1958. The model was fitted with surge brakes and leaf springs. The trailer came with heavy duty tires, tandem axles and one piece lapped roof. Aristocrat coach was produced during the most prolific production stage of the company between 1955 and 1958. The coach’s length was 28 feet while its overall length reached 31 feet. It had twin straight forged axles. Other features included propane system tank with front outside mount, fiberglass insulation in walls, ceiling and undercarriage, propane interior light, heater, ice box. The kitchen fixtures included 3 burner propane stove and oven. During the period from 1955 to1960 the company produced two park models of greater length. Both had twin tube axles.